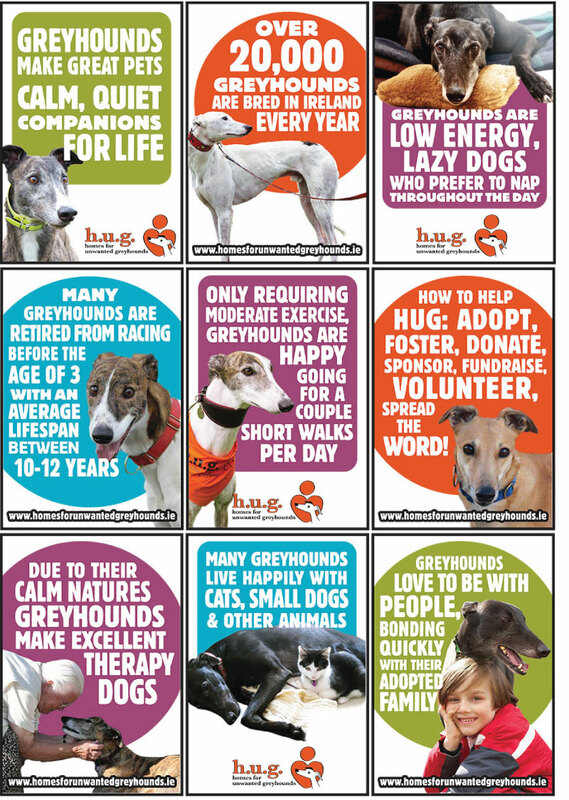 It’s been a busy few months for HUG (Homes for Unwanted Greyhounds) and we have a big promotional event coming up at the Pet Expo in Dublin in November, so I’ve been kept busy as well creating promotional pieces for print, our website and facebook page. 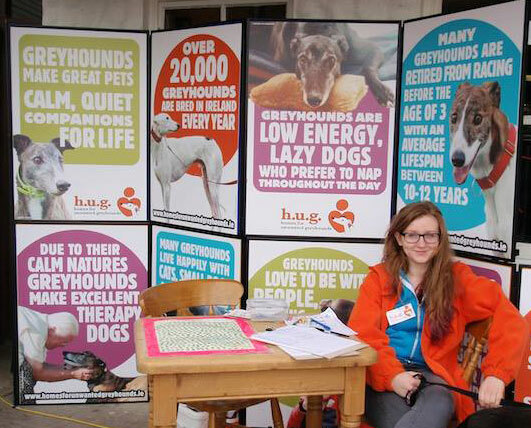 We had some older display boards which required updating with the new HUG branding and some simple, bold statements about greyhounds as pets. Thanks to the brilliant photography by Sarah at Hazeltree Pet Portraiture, the new display boards are eye-catching and colourful, and the boards can be re-arranged into different combinations depending on the event where they are to be used. They had their first outing at the Gig for the Greys at the Gap of Dunloe in Kerry in late August. 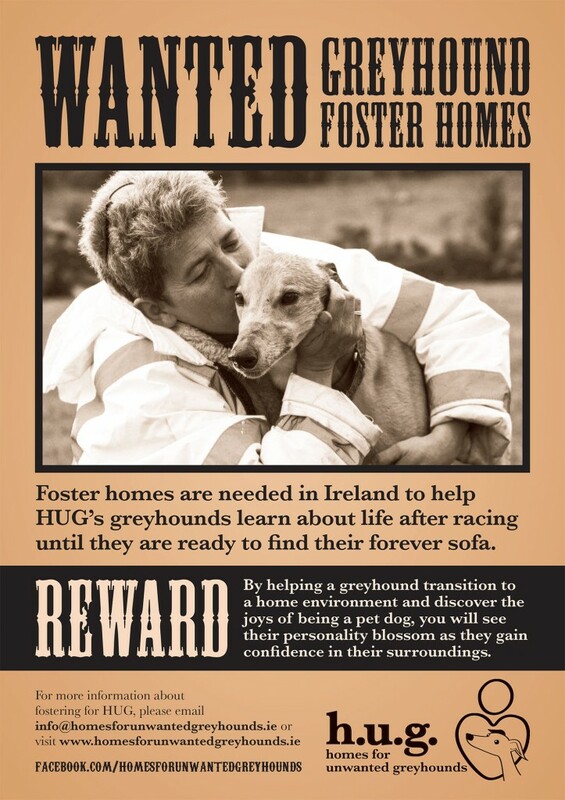 We’ve also had an unprecedented number of requests to take in greyhounds from trainers, pounds and the general public, so we put out an appeal for more foster homes in Ireland, which help us by having an additional place for a dog to stay, as well as teaching them about life as a pet dog. Most racing greyhounds have never been in a house before, so find all of the things we take for granted quite unfamiliar and often scary, such as stairs, mirrors, televisions, smooth wooden or tile floors, fireplaces and many other normal household items. Through the fostering process, the dog learns to accept these things without fear and also usually makes the best discoveries about life indoors, such as sofas, beds, warm places to sleep, kitchens full of food and being able to spend a lot more time with people! I put this poster together for HUG’s facebook page again, featuring Mary, one of our long-term volunteers, who said she always thought she would end up a ‘wanted woman’! And even though Halloween isn’t even upon us yet, it is already time to start thinking about Christmas! For the past couple years we’ve been talking about creating some HUG Christmas cards and this year I’ve finally gotten around to designing some, which are going off to print this week. 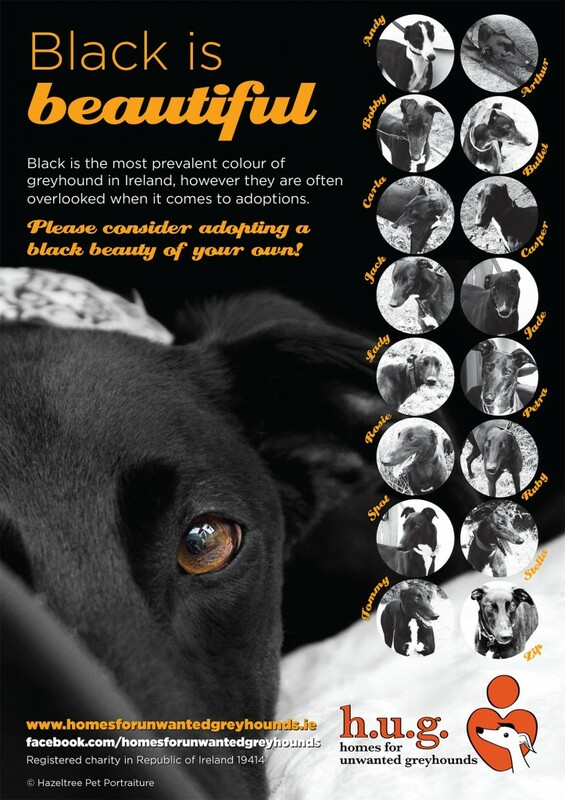 Our goal is to have them for the Pet Expo in Dublin, as it is a prime event for fundraising, as well as selling them online through our website and facebook page. 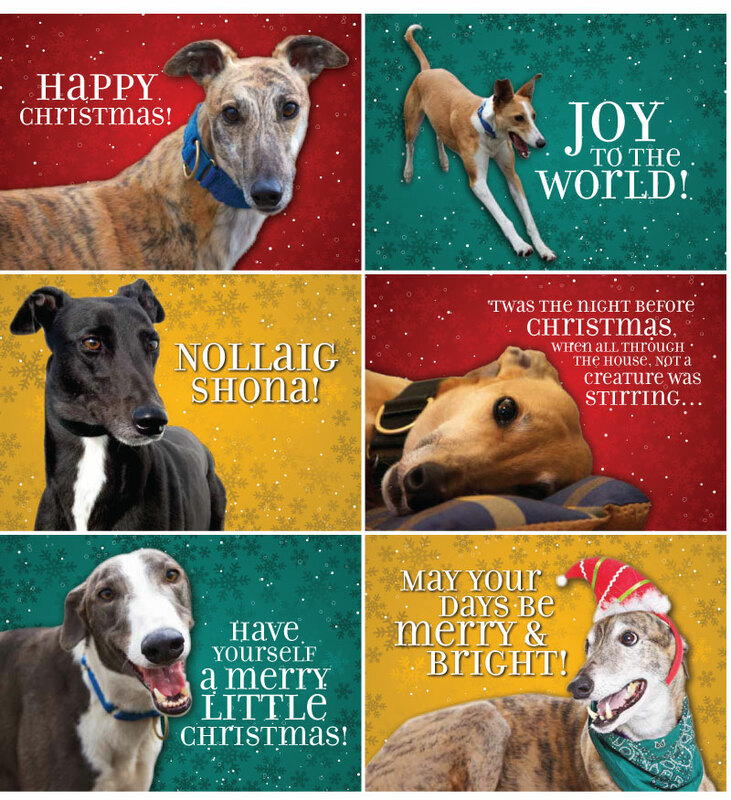 I will put up a link for their page once they are printed and ready to go, all proceed go towards HUG and should help to find homes for a few more Irish greyhounds in 2014!